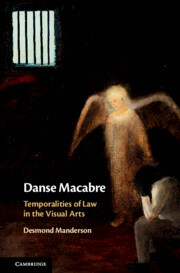 Desmond Manderson, Australian National University, is publishing Danse Macabre: Temporalities of Law in the Visual Arts (Cambridge University Press) (forthcoming June 2019). Here from the publisher’s website is a description of the book’s contents. The visual arts offer refreshing and novel resources through which to understand the representation, power, ideology and critique of law. This vibrantly interdisciplinary book brings the burgeoning field to a new maturity through extended close readings of major works by artists from Pieter Bruegel and Gustav Klimt to Gordon Bennett and Rafael Cauduro. At each point, the author puts these works of art into a complex dance with legal and social history, and with recent developments in legal and art theory. Manderson uses the idea of time and temporality as a focal point through which to explore how the work of art engages with and constitutes law and human lives. In the symmetries and asymmetries caused by the vibrating harmonic resonances of these triple forces – time, law, art – lies a way of not only understanding the world, but also transforming it.